Has it really been 15 years since Whoopi Goldberg sassed up that boring old church with some flashy Vegas glitz in Sister Act? It has indeed, and since that hit, there's been a pretty steady stream of movies that attempt to combine faith with laughs. Tyler Perry's Madea movies. Martin Lawrence mugging as "Preacher Don" in Rebound. Cedric the Entertainer's incongruous turn as a booty-shakin' pastor in Man of the House (wait, am I the only one who saw that? I am, aren't I…). The latest movie to try to have it both ways is First Sunday, ostensibly the next installment in Ice Cube's popular Friday series. 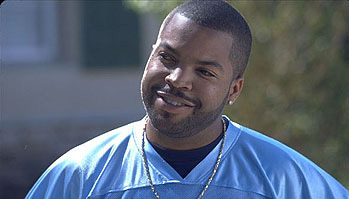 Cube plays a young man who seeks revenge on a neighborhood church that slighted his grandmother. He makes plans to rob it, until he sees the error of his ways, and no doubt, comes out of it a better, more spiritual person. The Friday brand was built around drugs, thieving, and some good old fashioned bodily function humor. Given the church theme, and Cube's recent remaking of himself as a family film actor, we can probably expect fewer drug jokes, and a whole lot more fart jokes in this film. Cube's last movie, the sequel Are We Done Yet?, pulled in about $50 million domestically, off a substantial chunk from its predecessor, so he's probably looking for a hit here. His supporting cast includes the, uh, idiosyncratic Tracy Morgan, the beautiful Malinda Williams from TV's Soul Food, and "Money Mike" himself from the Friday movies, Katt Williams. The director, David E. Talbert, is making his big-screen debut, having directed mostly video and television fare, like the seriously unwatchable concert film Jamie Foxx: Unpredictable. See the latest developments for this project on the First Sunday Movie News page.